Yesterday evening, my four year old nephew and I were talking about Border Collies and how they herd sheep. “Why do the dogs hurt the sheep?” He asked. Oh dear. I tried to explain the difference between “herd” and “hurt”, but I had the feeling he was more than a little confused. So I showed him a few minutes of this youtube video. My little nephew was fascinated and before long, he and his younger brother were chasing their eighteen year old uncle around the dining room. Apparently, he was the closest thing to a sheep that they could find to herd. But there is one thing that I neglected to tell my nephew about herding animals. And that is that cyclists are pretty awesome in their own right as animal herders. This morning, as I was biking to work in the dark, I spotted two deer standing by the roadside. As I neared them, they stood silently, staring deeply into my headlight. A vehicle came toward us from the opposite direction and I became a bit concerned: what if the deer decided to make a mad dash across the road and the car crashed into them? And in a panic, they hightailed it for the woods. It seems bizarre, but animals seem to trust speedy cars more than a person biking slowly by. I guess it is desensitization; they see car after car pass by day after day and they just get used to it. But around here, a cyclist is enough of a novelty to seem like an unknown danger. So the fact that animals are afraid of me, combined with my slower, safer pace make me an ideal animal herder. I am so ideal that I think I will ask the Department of Transportation to give me a stipend for the role I play in keeping animals off the road. After all, I have a great resume. I have herded sheep, cows, turkeys, mice, deer, snakes, turtles, rabbits, skunks and other animals to safety, away from the road. Please realize, however, that I am still a novice. I can’t, for the life of me, direct dogs to get off the road. With a dog, I am the one who gets herded. I plan on eating a lot of food today, so I woke up early at my parent’s house to get a ride in. Now that my road bike is retired for the season, I have been taking every opportunity to use my mountain bike on gravel and dirt roads that I have avoided all summer. Today we climbed up into the woods until my legs were aching. We explored a bit and then stopped to watch the sunrise. Thank you God for painting beautiful colors in the sky! Then it was time to speed downhill. I have never gone so fast on a mountain bike on rough gravel road. It was awesomely terrifying. I tried to refrain from using the brakes at all, but my cautious side kicked in before a couple of the sharp turns. Now I am back at my parent’s house feeling all fired up. I am ready to cook the turkey and eat it all! I have been out biking every single day since the beginning of June. Biking every day has changed my mindset. I used to think, “Should I bike today?” Now I think, “When should I bike today?” Biking has become a part of my everyday routine. There is only one foolproof method I know of to preserve this way of thinking: to ride my bike each day. Usually, that is not a problem, but today it was. I am assisting an elderly couple that needs around-the-clock care. I came here last night and I am leaving tomorrow morning, which meant there was no possible opportunity for me to go biking today. So I did what any responsible, twenty-four year old adult would do. I whined to my mom. My mom is an amazing lady, not only did she give birth to me and raise me, she was also willing to relieve me so that I could go on my oh-so-important ride. At five o’clock tonight, she came over and told me she could stay for an hour. Yippeee! I headed for the hills and some unpaved back roads because I was on the hunt for one thing. 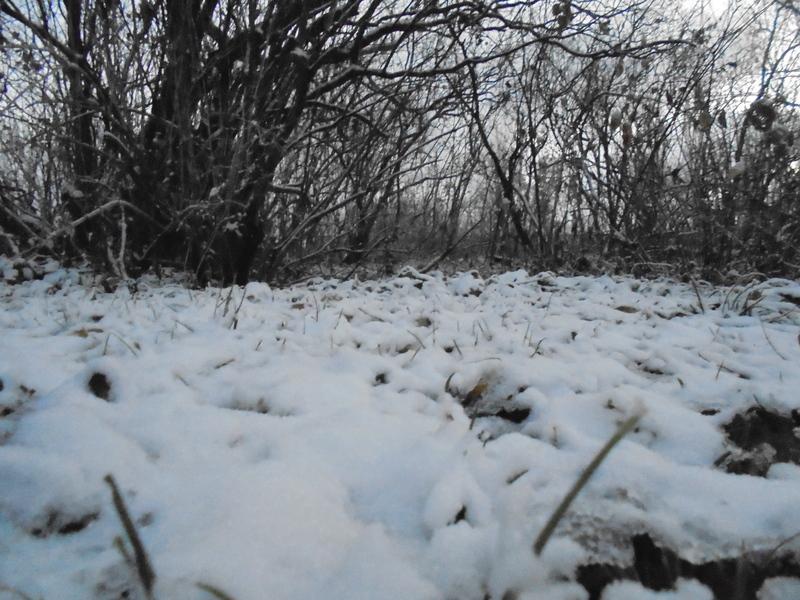 And soon I found it, a light dusting of snow covering the road. For miles it was just me and my bike riding in the darkness among creepy windmills which were making low whirring noises. The chilly air was refreshing and every part of me felt so alive. I saw deer and cows and made friends with a curious Siberian husky and before I knew it, I checked my phone to find I only had fifteen minutes left. Oops. 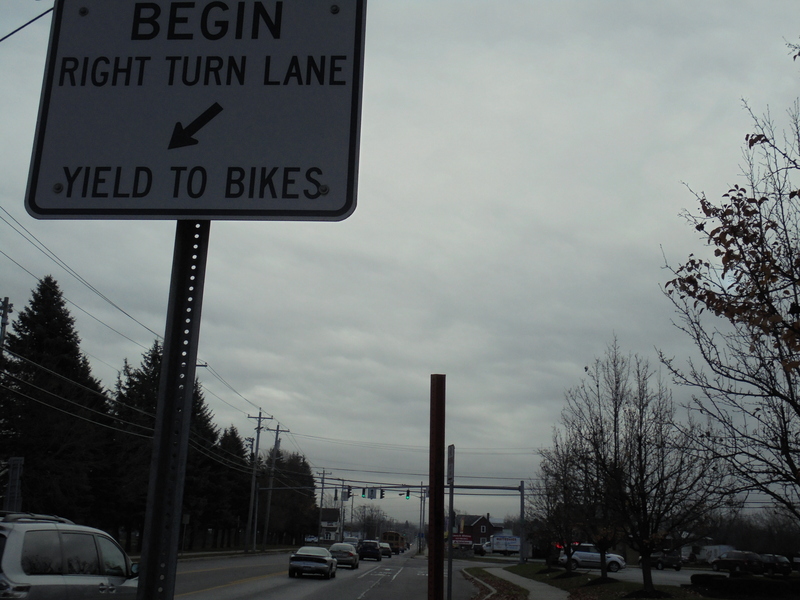 I made a U-turn and headed back as quickly as I could, urging my bike to fly down the hills. We pulled up to the house and I dashed inside. Today made me very thankful for a few things. I am thankful that my schedule normally allows me to bike every day. I am thankful that am in good health so that I can ride my bike every day-the fact that some of my cycling friends are currently sidelined really drove this point home. And at the top of my list, I am thankful for a mom who made it possible for her whiney daughter to get out for a bike ride. This is a picture taken on a bike adventure a few weeks back. Just after I pulled out of the parking lot at work today and into the road, a friend honked her car horn and passed me with a friendly wave. That got me to thinking about the intricacies of the spoken language of vehicles. In a typical week of biking, I get honked at by cars (or rather by their drivers) five to ten times. All of the honks directed toward me fall into two categories. The overwhelming majority of times a car sounds its horn, it is simply someone I know, saying, “Hi!” to me. My current record is four friendly honks in ten miles. It always makes me smile to get this kind of interaction. Sometimes I am blasted with a loud resounding honk by a driver who is clearly not happy with me for some reason or another. Thankfully, these instances are very rare. There is another type of sound a vehicle has used to get my attention, The Honk of Impending Doom . Which is also know as, “Please get off the road, or I may accidently smash you”. Warning other road users of danger is why car horns were invented, if my hunch is correct. But the meaning behind this honk is the same as the angry blare. Both drivers want me off the road, only difference is why they want me to yield to them. You would think that since cars are telling me, either, “Hi!” or “GET OFF THE ROAD!!!! !”, it would be easy for me to differentiate between the two. Nope. Car language confuses me, in many ways, all the time. This is how. The most common position for people to greet me with a friendly honk is when they coming up directly behind me. No matter how gentle of a sound it is, it always startles me and I probably jump embarrassingly high into the air. Some cars seem to only have a single decibel setting when they honk, and that setting is very loud! I assume the driver is angry at me until they pass and I see a friendly smile and wave. Once I heard a car honk and turned to wave but my hand froze in mid air when I was stared down by a red-faced gentleman. If you are mad at me, can you at least sound mad? When I enter an intersection, I feel very vulnerable. I am also on full alert-I don’t expect cars to see or yield to me-it is up to me to make sure I get through safely. So anytime a car honks while I am crossing an intersection I always think there is danger or someone is objecting to my handling of the situation. It’s neither. Every single time I have heard a car honk at me while in an intersection I have later discovered that it was someone trying to say hello. When someone honks at me, I like to smile and wave at them. Unfortunately, due to my less-than-perfect reflexes and the speed at which cars pass me, I often miss my opportunity. Then, later in the week, a friend will say, “I honked at you the other day but you didn’t even notice.” Oops. Because people in their cars often honk at me, I can easily fall into the trap of thinking that all car honking revolves around me and my bike. But I have discovered, to my amazement, that sometimes cars honk at other cars or pedestrians or even animals. When it comes to car language, I need to remember that is it not all about me. So what was my conclusion to this fascinating study of how I frequently misunderstand car language? There is none. Halfway through my commute home I was distracted by falling snowflakes and any thoughts of cars were banished from my mind. Even though it is still fall, I have decided to retire my summer bike, Winter, until spring. Though there is no snow on the ground, the roads are getting nastier each day. The amount of glass shards, grit and debris is increasing and I want to keep my road bike in good shape-I need her ready and raring to go for next year! So she and I went for our last ride of the season today. I rode knowing that it will probably be five months, maybe more before we ride together again. I will miss the crisp click of clipping into the pedals. And sprinting down the road in the highest gear. And riding in the drops to fly down hills. But we did have a great last day of riding together. The first nine miles there was a vicious headwind to fight, one of the strongest winds I have ever rode against. At times, when a particularly fierce gust would strike I was forced to drop into my second-lowest gear to maintain my cadence. To my right, a flock of geese was struggling to maintain their formation in the air. Finally, I reached my destination, my brother and sister-in-law’s house. For a few wonderful hours I was able to hang out with my sister-in-law and play with my four adorable nieces and nephews. We sang lots of songs and played lots of games. Before I knew it, it was time to leave. I knew exactly what I was in for on the way back to my parents’ house. Tailwind time! My bike and I went crazy. With the help of the wind, I was able to do something I have never done before on the flat-I was able to sustain 32-34 mph for minutes at a time. It felt insane. Someday I want to be able to do that without the need to exploit powerful gusts of wind. I arrived at my parents’ house feeling like I was on top on the world. I made supper for my family, to celebrate my mom’s birthday. Afterward I left to head home to my apartment. Four miles, with a strong tailwind and two large downhill sections. They were the last four miles of the season for my road bike and I. And also the fastest. Winter wanted to go out on a high note, I guess. That means it is up to me and the big guy to get through the next five months together. Are you ready, big guy? When I was biking up to my parent’s house last night, I accomplished one of my goals for the year. I finally reached the 6,000 mile mark. Sometimes I still forget how much my life has changed from just a few years ago when I was a sedentary couch potato. Back then, I wished I was more active but it seemed so daunting to get out the door to do any kind of physical activity. But I hoped that someday, when I was more disciplined, more determined, more hard-working and more motivated-I would get fit. I knew it wouldn’t be easy but the reward of being healthy and strong would be worth it. Fast forward to now. I have learned something about exercise. It’s fun. I didn’t bike 6,000 miles this year to get in better shape or to meet a goal or so I could live without a car (even though biking 6,000 miles helped me to do all of those things). I have biked 6,000 miles this year because locking my feet into the pedals with a satisfying click means the start of an adventure. I bike because it’s fun. Completely, fantastically fun. Dan, this one’s for you, because sometimes I take things way too literally. 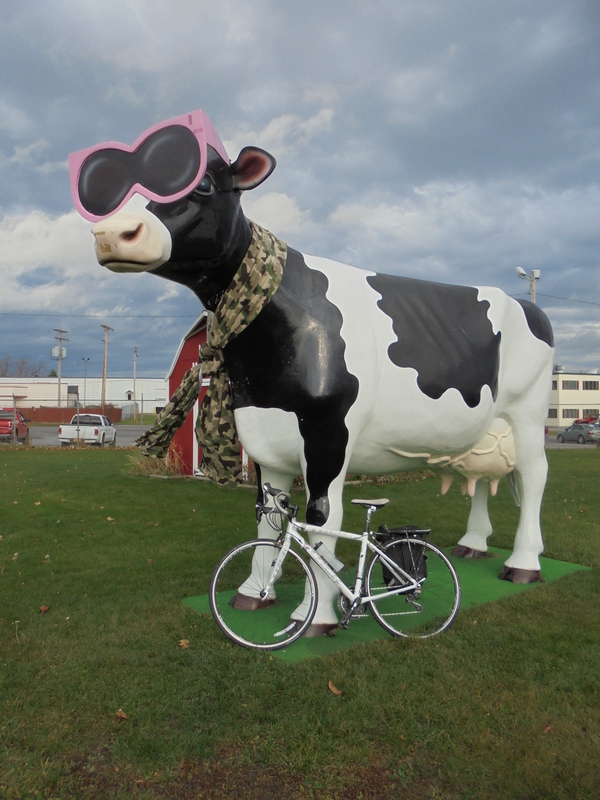 My bike and I are slightly obsessed with cows right now. I love living without a car. One of my favorite things about using my bike for transportation is that even the most trivial of errands can easily turn into an adventure. 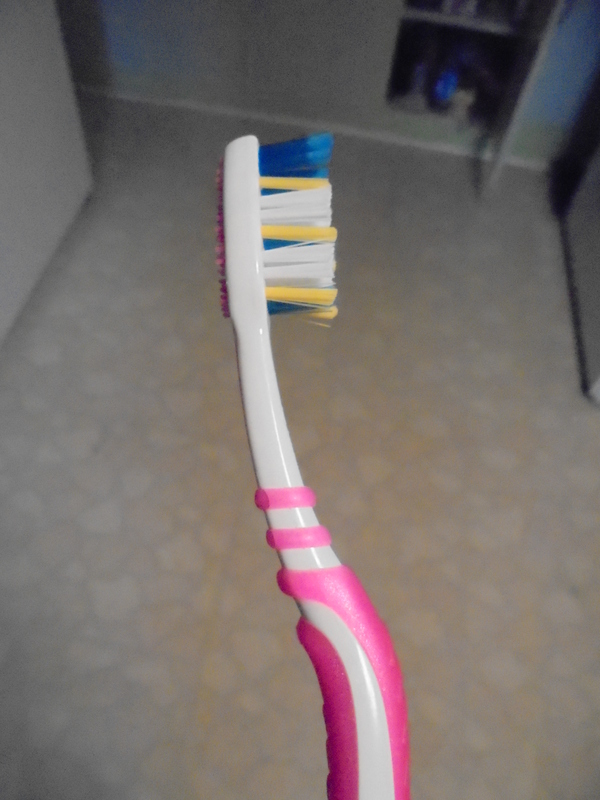 I have been needing to replace my aging toothbrush and I decided that today was the day. After a two mile ride I got to the store and because I am actually still a little kid, I picked out a toothbrush in my favorite color. Once through the checkout line, I clutched the toothbrush firmly in my hand and headed out the door and back to my bike. Before I was ready to jump back on, an older gentleman paused on his way into the store to talk to me about my bike. Him: Does it have good air-conditioning? Me: Real good. And the faster I go, the better it gets. Then he asked the question that all older guys ask me. It makes me want to laugh every time because they always think they are so witty and original by asking this question when in reality, every single guy in their age demographic ask me this. Thankfully, it is a fun question to answer. Him: How many miles do you get to the gallon? Me: Well, now that I think about it…I haven’t put in any gas since the day I got her, so I guess I get a lot of miles to the gallon. Him: So, are you a local? Me: Sure am. I live right in town. Him: Okay, you must not bike too much then. Me: I use my bike for transportation so I do bike every day. I love it! Him: That’s great, I used to have a bike. But what do you do in winter? 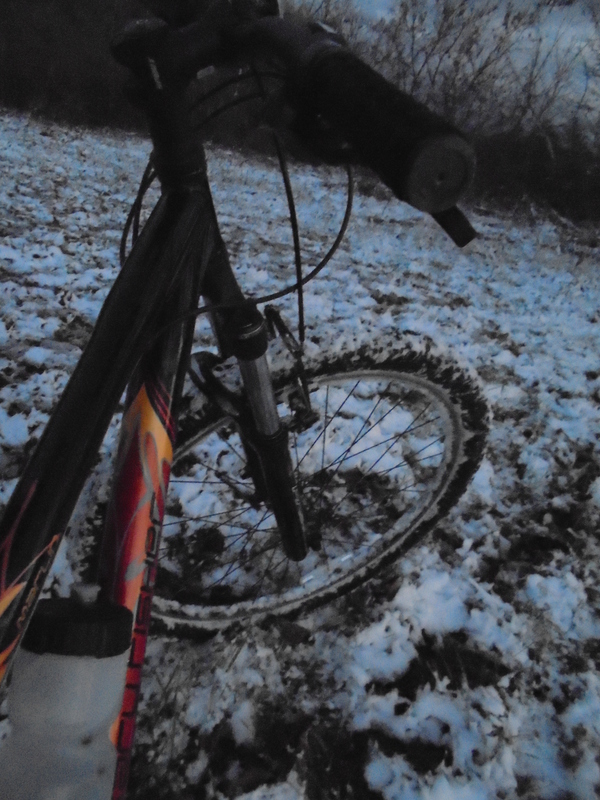 Me: I have a mountain bike with studded tires. Him: No way! That’s crazy! He began walking toward the store again and then looked back to deliver his parting remark. I chuckled. And then I remembered how scary those type of comments were last year. My, how things have changed. There were a lot of cars on the road as I biked up main street toward home. More than usual, it seemed. Ahead of me, I noticed an Amish buggy holding up traffic as the horse trotted carefully down the road. I also saw another horse and buggy coming down toward us on the other side of the street. It was the sweetest thing ever. When the horses spotted each other in the midst of a sea of motor vehicles, they both began to whinny and neigh, calling out happily to each other. My heart melted, they were so ecstatic to see a fellow horse in a world of cars. “Same here.” I thought. Seeing one cyclist on the road brightens my entire ride, although I usually refrain from neighing. The Great Toothbrush Adventure turned out to be a stunning success, especially for my teeth, which are currently very, very clean.